Types of Milk - Choosing the best milk for you! A visit to the dairy section of any grocery store reveals a dazzeling variety of types of milk, let alone milk-products. And every self-proclaimed expert (supplement sellers, usually) has their own blog pushing a particular type of milk. All claim theirs is the latest magical superfood, while all overs will kill your children. So here is a clear, simple and unbiased look at what's available. Apologies in advance to conspiracy theory types and those selling their own magic fad diet book. In decending order of fat content, most to least. Definitions of all types of milk and even "milk"
Acidophilus milk is the same as lowfat or nonfat milk (it comes it both types) with the only difference being that the bacterium Lactobacillus acidophilus has been added to it, the same bacterium in active yoghurt. It does not taste any different from regular milk. Some people believe that acidophilus milk is good for digestive upset, or can help combat lactose intolerance. At least one study bythe Mayo Clinic did not substantiate the claim that it helps with irritable bowel syndrome, but it certainly wouldn't hurt, either. Buttermilk started generations ago as a by-product of butter production and retains a slightly buttery flavor. Today buttermilk is made by culturing milk with a lactic-acid culture. The process produces a somewhat lower lactose content which may make it better for lactose-intolerant people. Evaporated milk is a canned milk product. About 60 percent of the water in milk is removed and the milk is homogenized and canned. It is typically used emergencies. To use evaporated milk in cooking, famously, in pumpkin pies, and rare is it reconstituted to drink... as it tastes little like fresh milk. Straight out of the can its thick texture makes it a good low fat substitute for heavy cream in cooking. Fat Free milk has less than 0.5 g of fat per 8 oz. Fat-free milk has as much fat as possible removed. It usually contains less than half a gram of fat per cup, deriving just 5 percent of its calories from fat. Fat-free milk has about half the calories of whole milk. Today some dairies are taking some of the natural water out of their fat-free milk, or adding back in some nonfat dry milk, to give the milk a more appealing appearance and a mouth feel that is closer to reduced-fat (2%) milk. Goat’s milk is nutritionally similar to cow's milk but is slightly higher in calcium and has less vitamin B12 and folate. Goat’s milk is higher in fat, although it has a higher percentage of small fat globules. Advocates say samller fat globules are more easily broken down by digestive enzymes, but homogenized cow's milk is almost identical to that, since homgenization reduces the size of the fat globules in cow’s milk. Lactose Reduced milk is milk in which the natural sugar present in milk, lactose, has been broken down, by the addition of an enzyme, into two separate sugars, glucose and galactose. The helps people who are lactose-intolerent digest the milk or dairy product. There are no nutrutuinal difference between this and other milks. The milk tastes the same as regular milk. 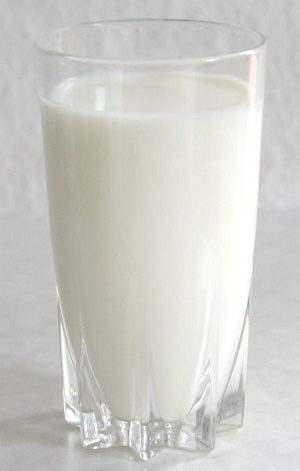 This is milk from which enough milkfat has been removed to produce a milkfat content equal to or less than 2 percent. This is not considered by most dietiticians to be a really low amount of fat, as this is saturadted animal fat. This is the sdame as fatfree m,ilk; just another name for it. Nonfat Dry Milk (NDM is made by removing water from pasteurized skim milk in a low-pressure/flash evaporation process. It usually contains 3 to 4 percent moisture and 1 percent milkfat. Outside of the U.S., it is called skimmed milk powder . According to the U.S. Department of Agriculture (USDA) milk may only be called "Organic milk:" if it is from cows exclusively fed organically grown feeds, kept in pens of certain size dimension, allowed periodic access to outdoors and sunlight, and cows that are not treated with hormones or antibiotics. NO milk, neither organic nor conventional milk, can be used for human food consumption if it contains any antibiotics. Both organic and conventional milk are tested for the presence of antibiotics, bacteria, and for proper storage temperature by the milk hauler/milk processor before it leaves the farm. If any antibiotics are detected in a load of milk from a dairy producer the milk is then discarded and NOT used for human consumption and the dairy producer must pay for the load of milk. Most states and the federal government define raw milk intended for human consumption from one or more healthy cows, goats, sheep, or other hooved mammals that has NOT been pasteurized or homogenized and is packaged for human consumption. . Raw milk is not treated in any way; not pasteurized, separated, standardized or homogenized. Reduced fat (2% milk), contains 2 percent milkfat by weight and not less than 8.25 percent nonfat solids. It’s important to keep in mind that while “2% milk” refers to the milkfat percentage by weight, much of milk’s weight is water. Once you subtract the water from this type of milk, you’re left with a product that contains 20 percent fat by weight. In fact, such milk actually derives 35 percent of its calories from fat. Drinking reduced-fat milk is a good way to wean yourself from whole milk at first, but it is still too high in fat to be a permanent choice, unless your diet is otherwise very low in fat and you’re at a healthy weight. Rice milk is another faux milk, (i.e., it ain't really milk). But like almond milk and soy milk it is good for those who are lactose intolerant or allergic to cow's milk. Rice milk is made from water and brown rice. Skim Milk is milk from which enough of the cream has been removed to reduce its milkfat content to not more than 0.2 percent. Skim milk still contains protein, lactose, minerals and water–soluble vitamins, but by rtemoving the fat, it only half as many calories and much less cholesterol than whole milk.. After pasturization vitamins A and D are typicaly added. Sour sweet milk is milk made with added vinegar or lemon juice. To make a cup of soured milk, add a tablespoonful of the vinegar or lemon juice to a cup of milk, mix and let stand for 5 minutes. Not really milk at all it's made from soybeans that have been soaked, finely ground, cooked, and strained. People who have food allergies, vegans and those who are lactose intolerant often prefer it . A comedian once said "what it takes to turn a brown soybean into while milk is anything but natural"!. Sweetened condensed milk: is a canned concentrate made of whole milk with added sugar. In both whole and fat-free cersions it is used in cooking and baking, for example, Key Lime Pie. UHT milk is milk that has been pasturized using ultra high temperature in which the milk is heated to 280° F for at least 2 seconds. Typically, UHT milk is packaged in aseptic shelf-stable containers so as not to require refrigeration after being sealed. Whole milk is the milk, without anything removed or added. It is 3.25% milkfat by weight.. There are 150 calories in an 8-ounce glass of whole milk, with 8 grams of fat (12 percent of daily value). US federal law requires that whole milk must contain at least 3.25 percent milkfat and 8.25 percent nonfat solids by weight. United States Department of Agriculture: Agricultural Marketing Services. (2011, March). National Organic Program Handbook. Retrieved February 27, 2016 from USDA.